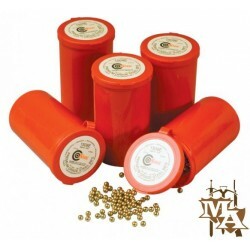 Shooting Accessories - Master of Arms LTD.
High quality Swiss Arms CO2 caplets for use in BB guns, Air guns and Paintball guns that use 12 gram CO2 capsules. Spare limb tips for 80lb crossbows. Spare limb tips for 175lb crossbows. A large cardboard target. Perfect for Archery, Crossbows or even Air Rifles. Approximately 42cm x 42cm. Spare, hollow elastic that fits all our slingshots. 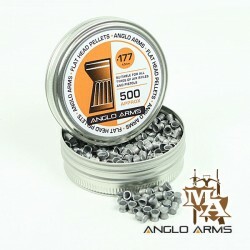 Pack of 75 9mm steel ball bearing slingshot ammo. Spare bow string with limb tips, that will fit both our 50lb and 80lb crossbows. A standard trigger lock supplied with 2 keys Fits most rifles, shotguns, handguns and crossbows Easy push together installation Soft inserts protects trigger area surfaces Two fast release double sided keys Provides security and safety Never fit on a loaded gun! A pack of 3 crossbow string lube / wax sticks. 12 x 6.5 inch Zombie aluminium crossbow bolts suitable for 50lb and 80lb pistol crossbows. A tin of .177 pointed pellets. Excellent quality for use with all .177 calibre guns. 500pc per tin. 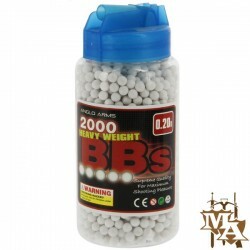 A tin of .177 flat head pellets. 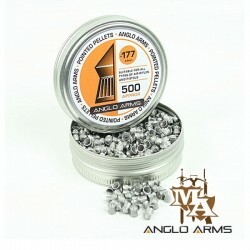 Excellent quality for use with all .177 calibre guns. 500pc per tin. 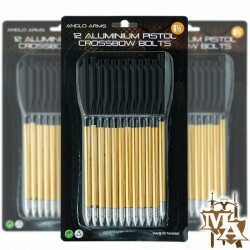 12 x 6.5 inch aluminium crossbow bolts suitable for 50lb & 80lb pistol crossbows. Anglo Arms cocking rope simplifies cocking any crossbow by decreasing the cocking tension by half. Suitable for all recurve crossbows. A pack of 3, fibreglass 30" arrows, Suitable for most bow types. 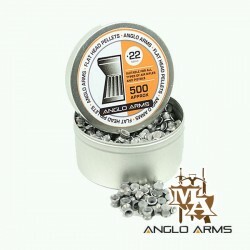 A tin of .22 flat head pellets. 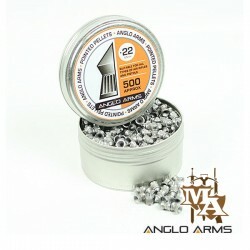 Excellent quality for use with all .22 calibre guns. 500pc per tin. A pack of 3, aluminimum 30" arrows. A premium arrow type, usable with any bow type (with the exception of very small children's bows) and ideal for larger compound bows. These arrows also feature a screw pointed tip.